Bsmall Publishing has just sent us a little craft book from their Five Crafty Ideas Series: Hearts . 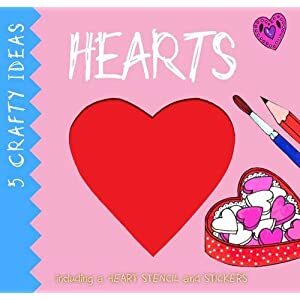 It is a little gem including five lovely,easy Valentine's crafts. We don't normally "do" Valentine's Day but Defne has been asking about all theValentine's displays around the town. So I told her that Valentine's Day is a time to celebrate with our loved ones and to tell them how much we love them. She wanted to make cards for her teacher and friends using the book as a guide. There is a heart stencil and stickers in the book. What five year old girl can resist these? Other books in the Five Crafty Series include Eggs, Stars and Pumpkins. Bsmall publishing specializes in bilingual and activity books. Disclaimer: Thanks to Bsmall Publishing for sending us a review copy.